AgriChemWhey | An integrated biorefinery for the conversion of dairy by-products to high value bio-based chemicals. Scale up from Demo-scale (75 MT per capacity annum) to commercial scale (20,000 tonnes per annum capacity) of biorefinery technology for the conversion of food processing residues to food, feed and polymer grade LA and confirming techno-economic viability of the integrated biorefinery approach. Optimise process technologies to reduce the time it takes to produce LA from WP and DLP, increase the yield from 85% to 95% and improve the purification process so that a high purity LA can be achieved using a simplified and energy efficient downstream process. Establish a new WP and DLP to LA and PLA value chain based on increased surplus WP and DLP from the dairy processing industry and create a major new second generation value chain for the growing global LA and PLA market. Establishing industrial symbiosis with local partners to valorise gypsum, calcium phosphate and fermentation residue (bacterial biomass) side streams arising from WP and DLP to LA process for agricultural use and human nutrition to improve sustainability and boosting economic return on investments. Ensure successful commercial operation of the biorefinery including plans to increase LA production volumes and economies of scale, new capabilities to produce PLA and higher added value valorisation of side-streams and the development of a blueprint for replication of the AgriChemWhey model in other regions across Europe. Rural community development through rural job creation. Securing the future for dairy farming families through an increase in dairy farmer incomes and protection against income volatility. Regional development, in regions facing industrial transition, through the replication of between 1 to 5 AgriChemWhey-like Plants arising from private investments up to 325 MEUR. Positive impact on EU trade balance through greater resource efficiency resulting in the reduction of EU LA imports (80,000 tonnes per annum) and the potential to turn Europe into a net exporter of LA. Industrial symbiosis for the creation of new value chains. Providing inspiration to society and industry to support the growth and competitiveness of a European circular bioeconomy and trans European cooperation. CO2 savings, from 18,000 tonnes CO2eq/year up to 89,000 tonnes CO2eq/year (based on 1 to 5 AgriChemWhey like plants). Our experts will be happy to answer any further questions you may have on the bio-based economy, AgriChemWhey and EU funding programmes and projects. This project has received funding from the Bio Based Industries Joint Undertaking under the European Union’s Horizon 2020 research and innovation programme under grant agreement No 744310. 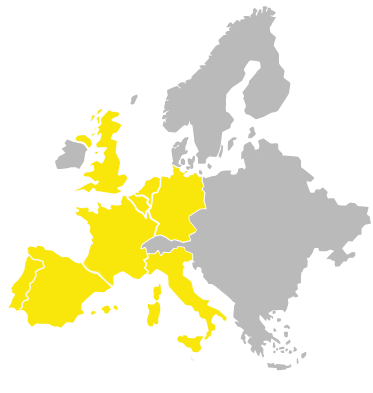 PNO is part of the consortium.